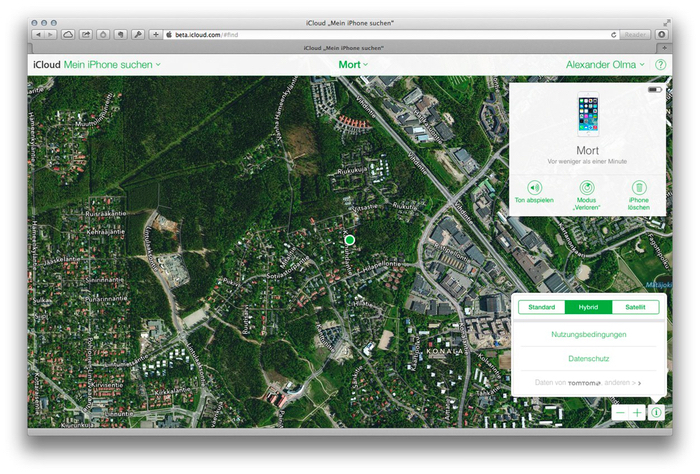 Apple is beginning the transition to move its Maps application online starting with the Find My iPhone web app on its iCloud.com beta website, as noticed by iPhoneBlog.de [Google Translate]. Though the public version of iCloud.com is still pulling data from Google Maps,beta.icloud.com now uses an online version of Apple maps for its location information. Apple has been slowly switching away from Google Maps after using the competing mapping service in the early versions of the iOS. The Cupertino company dropped support for the Google-based mapping solution and introduced Apple Maps as part of iOS 6 in 2012. While iCloud.com still remained tied to Google, iOS apps such as Find My iPhone and Find My Friends also were converted to Apple’s mapping data in the same year. After a highly-criticized launch, Apple has been making efforts to bolster its mapping data, recently improving its points of interest database as well as notifying users when reported problems had been fixed. Apple was said to be adding indoor mapping and other new features to Apple Maps in iOS 8, but internal politics and the departure of key employeesmay have delayed those plans.